2. The Communicator options will open. Click on Send a Message. 1. Membership Group - select members based on their member type (players, coaches, umpires, officials), select administrators from the club contacts, and/ or select team contacts. Club Contacts - click on the Contact Type drop-down list select the type of club contacts you want to send the message to. Players - click on the Registered in Season drop-down list and select a season. This will send the message to players registered in that season. Click on the Include parents check box to also include players' parents as recipients. Coaches - click on the Registered in Season drop-down list and select a season. This will send the message to coaches registered in that season. Umpires - click on the Registered in Season drop-down list and select a season. This will send the message to umpires registered in that season. 5. Click on Custom Group if you wish to use this option. 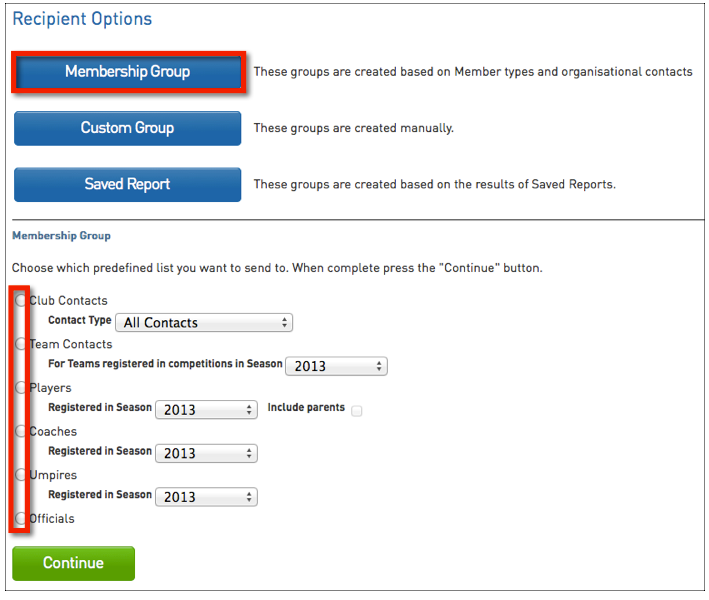 Click on the Groups drop-down list and select the group that you want to send the message to. 6. Click on Saved Report if you wish to use this option. 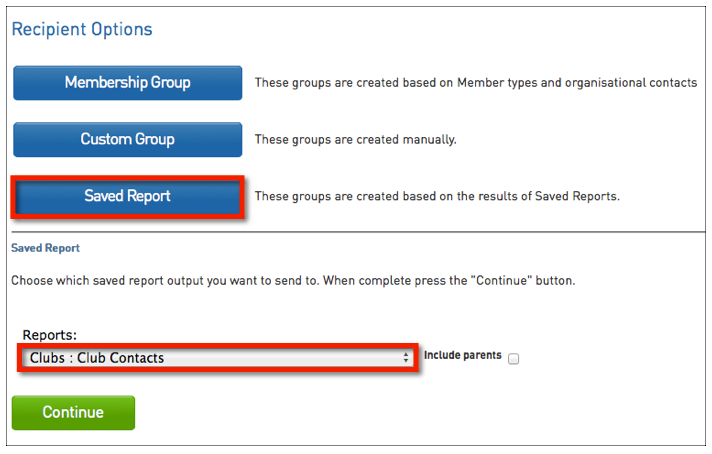 Click on the Reports drop-down list and select the saved member report that contains the recipients that you want to send the message to. 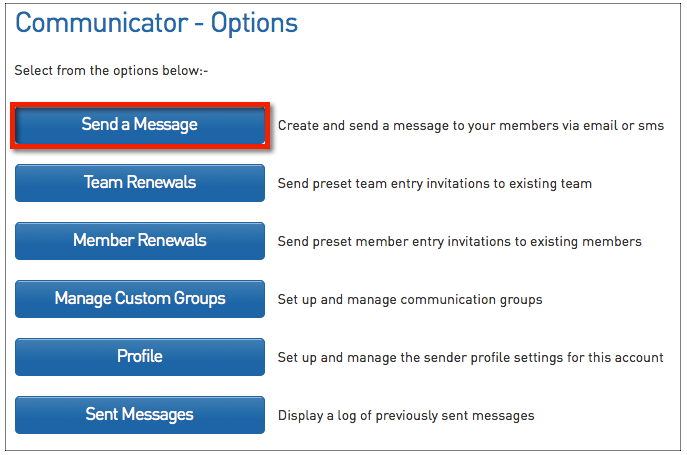 Tip: If you obtain permission from members to send them communications, you can use the 'mailing list' field to manage those that do/ do not want to receive communications. If you use the Mailing List field, be sure to include it in your custom report (eg. Mailing List = 'Yes'). 7. Once you have selected your recipient option and specified the settings for that option, click on Continue. The communication methods available - choose whether to send the message via SMS, Email or Combo. The 'Combo' option will send an SMS to all recipients with a mobile number and an email to recipients that have an email address but no mobile number. 2. Click on the communication method that you wish to use - SMS, Email or Combo. The next step is to compose and send the message. Click on a communication method below for instructions on each method.